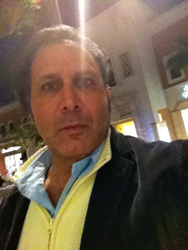 Jeff Mustard, veteran film and tv professional writes demo script and produces sizzle reel for half-hour TV series nationally syndicated on the "Food Network," hosted by Hollywood Legend, George Hamilton. "Who better to host a lifestyle, entertainment TV show about the good life than George Hamilton," says Jeff Mustard. With a name like Mustard, it’s only natural that a guy would get a break as a writer in the television industry for a food show. And so it is that Jeff Mustard, an advertising/ marketing/public relations professional and award-winning writer/producer was tapped to pen and produce the promo trailer for “The Best of Wine & Food,” a half-hour series hosted by long-time Hollywood legend, George Hamilton, syndicated nationally on the Food Network. The show concept--mix a world renown celebrity talent— George Hamilton, and have him do what he loves best, “explore and experience the best life has to offer” in a show appropriately named, The Best of Wine & Food. “It’s more than a taste of the good life, it’s a feast of the finest life has to offer, a half-hour weekly, The Best of Wine & Food is a gastronomic display guaranteed to satisfy sumptuous tastes and scintillating sensibilities.” That was the opening line of narrator voice-over copy in the demo script. Get the idea, this is a show for people who love the good life, live the good life and enjoy eating and travelling well. “Who better than to have Mr. Hamilton host the show,” says Jeff Mustard, a multiple award-winning writer/producer, and also an award-winning documentary filmmaker. “Fast paced and power packed with spicy subjects and special segments, The Best of Wine and Food does more than fill your stomach, it’s a full plate of ideas to make dining, travel and leisure more fun and exciting,” the copy continues. “The producers of the show loved the script for the show trailer and asked me to produce the show’s sizzle reel,” says Jeff Mustard, whose work has been published and produced locally, regionally and nationally in print, radio, television and the stage. The approximately four-minute demo used to sell the show was a hit, the sponsors signed on and Mustard scripted 8 half-hour shows featuring some of the world’s largest companies whose production included a blend of studio and on-location shooting. Jeff Mustard is an advertising, marketing, and public relations veteran with various companies in mass media marketing and communications. While his company, http://www.TheDocumentaryProducers.com specializes in documentary filmmaking, he has written long and short format scripts for television, including thirty-second TV commercials, thirty-minute infomercials, direct response advertising for radio and television, and numerous sales and marketing videos, including industry recognized award-winning work. His advertising, marketing, public relations and writing strategies have helped launched start-up enterprises and grown organizations into multi-million dollar corporations. He has worked at the highest levels of business, government and the political arena including gubernatorial, White House, and the United Nations. He is a multiple award-winning writer, producer, director who has worked with clients large and small across the country as marketing consultant or provider of advertising, marketing and communications services, including a significant amount of specialty work in Financial Services, Real Estate and Healthcare. http://www.TheDocumentaryProducers.com – a full-service film and video production company. http://www.TheBambooAgency.com – a full service advertising, marketing, public relations company. http://www.FloridaArtBrokers.com – an art brokerage/art representation company.